Over the June school holidays we took the Spirit of Tasmania for a quick winter break. The ship docked at 6am and we were off soon after 6.30am. 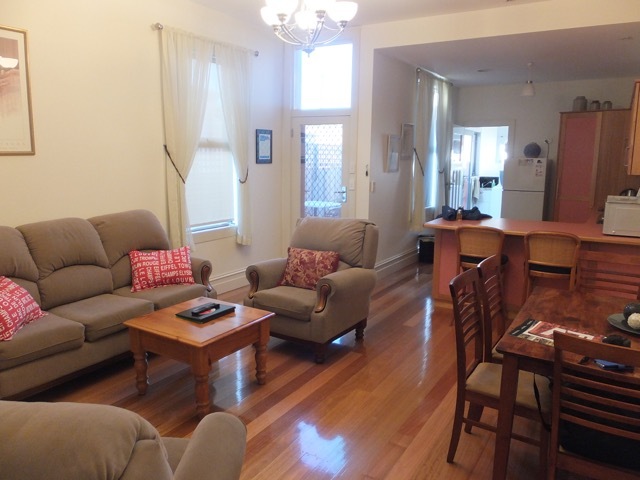 Finding suitable family accommodation Launceston was relatively easy. 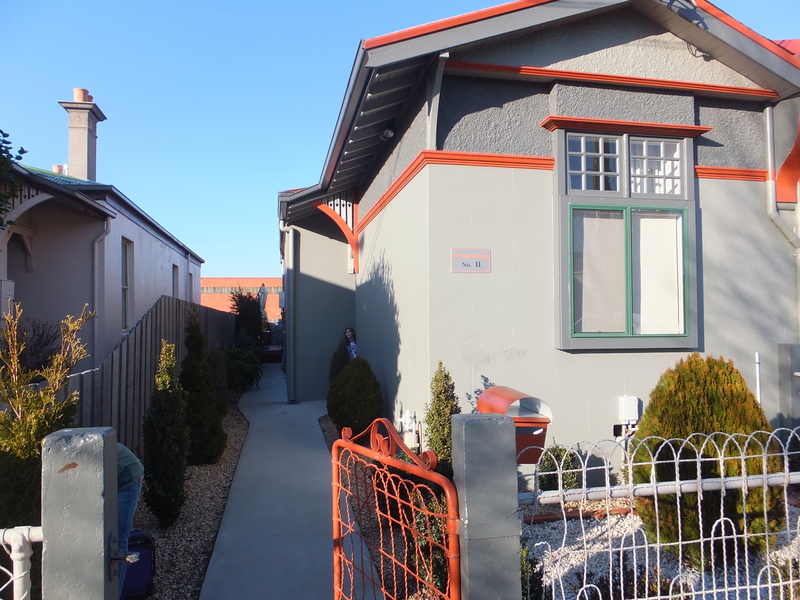 We arrived on the Friday morning and we had a house booked through Stayz for two nights over the weekend in Launceston. Craig was flying in that evening as he had work commitments and could only get away for the weekend. About 7pm the evening before when I was on the Spirit of Tasmania, I received a call from the house owner, Denise. She was enquiring if we were getting the boat over. When I confirmed that we were she advised we could go straight to the house as there was currently no one in it. She had also organised breakfast for the kids! Denise was making a cracking impression already! The house had a code lock on it so we didn’t even have to collect the keys from another location or meet anyone at the house. Swamp Cottage, first impression count and its very tidy and well kept. As it turned out, this was a life saver as one of the kids had had a toilet accident and it was made much more bearable considering I had somewhere to go and shower him. As you may have read in the Spirit of Tasmania post, we had a pretty rough night so this kind gesture was very well received. 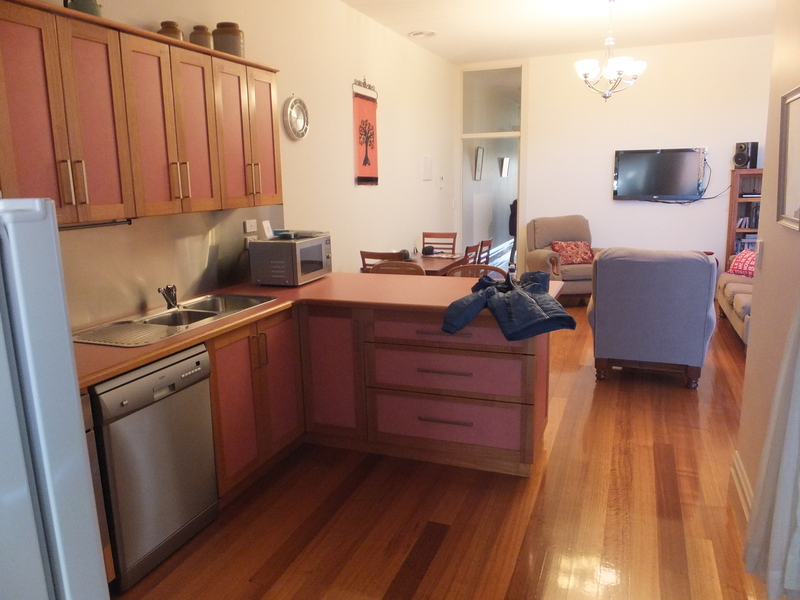 I found the house fairly easily, it was close to town in Invermay, only a couple of kilometres from Launceston city. We had on street parking right out the front of the house. There was also a back entrance for off street parking, the keys were located inside. We took our stuff inside, had something to eat and a shower and we were fresh for a day out at Cataract Gorge. The house was semi-detached, sharing a common central wall with the neighbours. The house had floor boards throughout and both the bathroom and laundry looked like they have had a recent update. They were very clean, with plenty of clean towels and products in the bathroom to use during our stay. I hadn’t asked but had hoped there would be a hair dryer and there was, which I suppose is pretty standard these days. 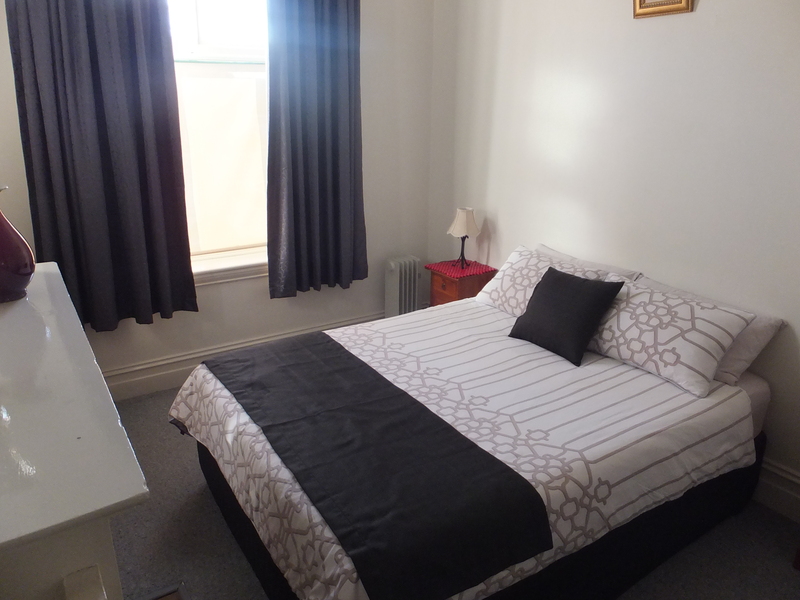 Not only is this property great for families, it would also be perfect for a ladies weekend away in Launceston. On this occasion I didn’t need to use the laundry but when you are travelling with kids theres always a chance you might need one. 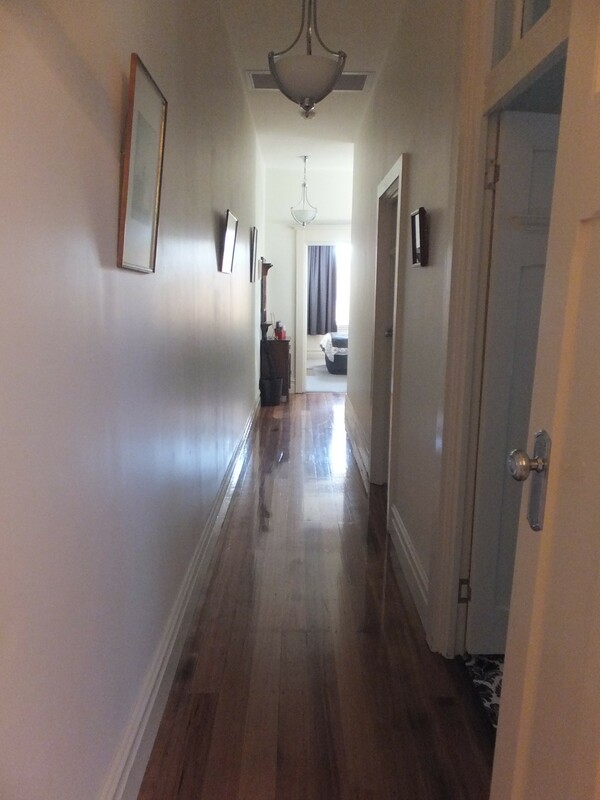 Hallway from the lounge and kitchen to the bedrooms. The kitchen was also recently renovated and had all modern facilities. It was a fully stocked kitchen with all the equipment required for preparing meals. Our first night we decided we would cook after I did some shopping at the local supermarket. Pasta is the kids favourite and is quick and easy to prepare and saves us buying another meal out. When travelling its much more cost effective if you can prepare food where you staying rather than eating out every night. 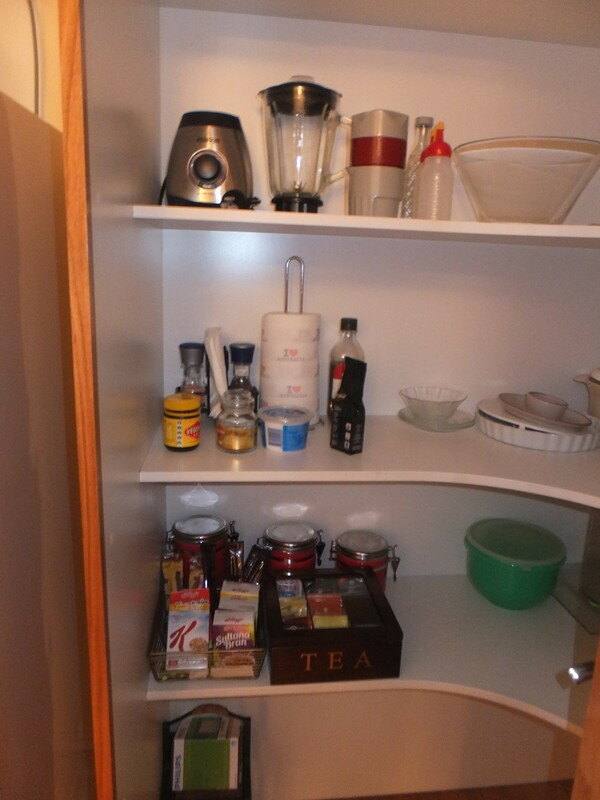 Its the small things that matter when you are renting a house, for e.g. the coffee & plunger, the choice of teas, a cereal selection for the kids, the 1 litre carton of milk in the fridge and the colouring books in the book shelve to entertain the kids. One thing I really loved was an un-complicated TV, I turned it on and it worked! Always worry about this if Craig isn’t around – being technologically challenged myself. Enough breakfast and a selection of tea for me the tea drinker! The lounge room was very comfortable, the couches cosy, a real home away from home feel, which is what Denise told me she was hoping to achieve. I think she has hit the nail right on the head as it is a warm, welcoming and cozy house. Best of all it has central heating which is always a hit for me. I like that the bookcase in the lounge had kids books and some colouring books and pencils for the kids. The kids were straight into that when we arrived and that gave me time to have a shower and get organised. The master bedroom has a fireplace but I think its for decoration only. The central heating is very effective so you would not really need to use the fireplace. 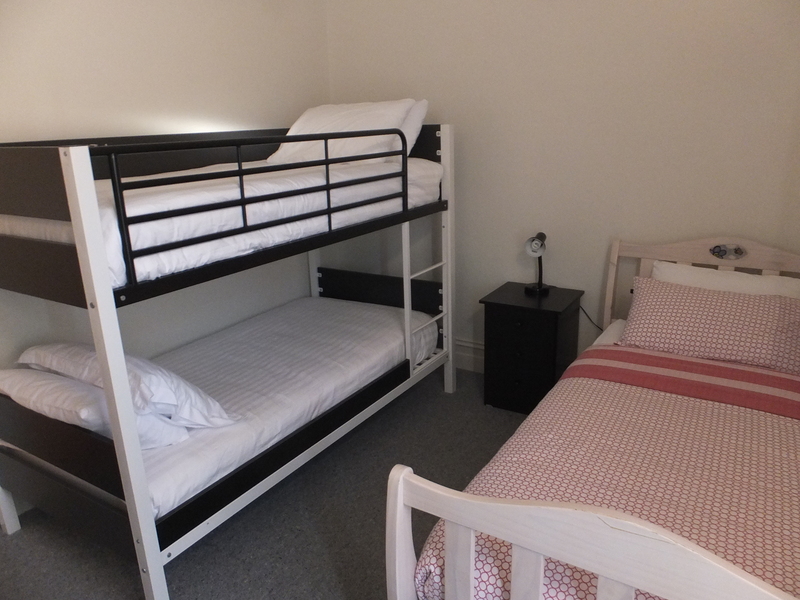 The bedroom is well furnished and the bed was very comfortable and there was plenty of space around the bed. The kids bedroom had a bunk bed and one other single bed. The room is large so was able to accommodate all three kids comfortably. The kids slept very well after the rough night on the ship the night before. The kids loved this room and of course fought over the top bunk. There is a small side way to walk around to the backyard which has space for off street parking. We parked out front and didn’t have a problem with that. 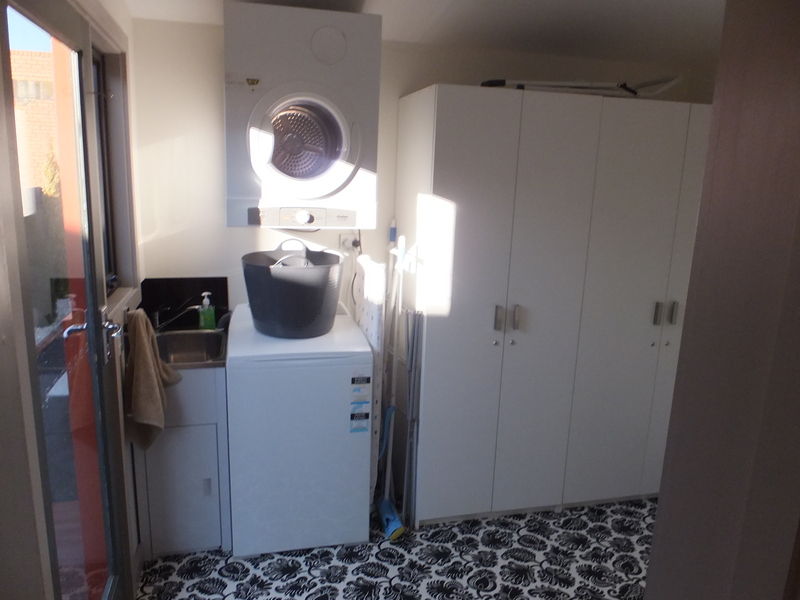 There is a second toilet located at the rear of the house in the laundry, also handy to have an extra toilet. Laundry, to the right is another toilet. This house can be found on Stayz, I negotiated a price with Denise directly for $165 per night which I thought was pretty reasonable. I would be more than happy to stay at Swamp Cottage again, I loved the location and the facilities provided and found Denise to be a wonderful and thoughtful host. I highly recommend staying here if you are in Launceston. I thought it a strange name to call a place but later found out from friends that Invermay was originally a swamp, and it known to still flood during heavy rains! Thankfully not while I was there. A one hour drive from Launceston is Beauty Point, they have a few family friendly activities that my kids really enjoyed, we visited Seahorse World and Platypus House. You could do them both in a couple of hours and head back to Launceston in a day trip. I little further a field is Cradle Mountain, we did it in a day trip but I would have preferred to stay. It’s a must see when visiting Tasmania. ‘Swamp Cottage’ as a name hardly sounds inviting, but it sounds like you booked a gem of a place. How great was it that you could go straight there from the boat and not have to wait until the official check-in time? And having breakfast and colouring books for the kids ready. That’s going the extra mile, eh? Hi Sandra, it was a very pleasant surprise, I wasn’t sure what to expect but we were extremely happy with Swamp Cottage. I was blown away by the exceptional service provided by our host. I strongly recommend anyone travelling in the area to consider this property when looking for a ‘home away from home’ experience. Have you guys been out and about lately? Weather hasn’t really been favourable.